The Windrift House is a recently remodeled 4 bedroom, 2 bath gem which offers breathtaking views in every direction. Picture windows flank the entire north side of the home, from the mudroom through the kitchen on into the living and dining room and into the Master bedroom, offering stunning views of the Strait of Juan de Fuca, Mt Baker and the Dungeness National Wildlife Refuge. From the south side of the home, the Olympic Mountains can be seen in all their grandeur. This stunning property can be enjoyed by young and old alike. Curl up by the fireplace and enjoy sipping your coffee while watching the myriad of wildlife. Eagles soaring, seals playing in the sea or deer grazing on the lush lawn and surrounding gardens will captivate your attention. For the adventurous, follow the path leading to the beach for beach combing and clam digging when the tide is out. Bring your own kayak or SUP board and launch right from the beach. Plenty of space for families, or couples traveling together, the house comfortably sleeps up to 8 guests. 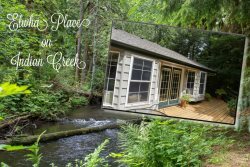 This warm, inviting and beautifully decorated home is the perfect destination for exploring the Olympic Peninsula and Olympic National Park as well as the many local adventures around Sequim. Enjoy nearby Lavender Farms, biking the Olympic Discovery Trail, walking in the soft sand along the Dungeness Spit or driving through the wild at the Olympic Game Farm. Cedars at Dungeness is just 5 miles up the road and boasts not only a beautiful 18 hole golf course, but two wonderful Northwest cuisine restaurants. Great house for those weekend golf tournaments! Propane BBQ, seasonal use May - Oct. Very accommodating to a family, well maintained property. Wonderful, gorgeous view. This will be my 'go to' vacation house for Sequim! Fabulous getaway, mothers and daughters, all seniors, were thrilled with this wonderful place. The views are incredible, the garden has many finches, hummingbirds, etc. and deer walk across the yard. this place gave us privacy, ease of access, convenience and calm and we all would definitely love to stay again. Brigadoon/Sequim Vacation Rentals went out of their way to make us feel welcome and made sure we had everything we needed. I highly recommend a visit. I could easily see staying there for an extended period. The house was immaculate and the kitchen was stocked with every gadget you could want. The view was spectacular whether you were sitting at the kitchen table, hanging out in the living-room or snuggling in the master bedroom. The house is far enough out to feel special and in the "country" yet close enough to the town and other activities to be convenient. I could see visiting again as a girls weekend, family reunion or group of friends gathering. My family came flew in from all over the country to celebrate our Mother's 90th Birthday here at this beautiful house! We were SO happy with all of the wonderful amenities: the gourmet kitchen, the two separate bedroom wings (LOVED the Master bedroom), the cozy living room with fireplace-all with amazing views out to Dungeness Spit! It was Presidents Day weekend, so not ALOT of sun, but we still thoroughly enjoyed all of the great activities that Sequim has to offer! When we weren't gallivanting around, we stayed nice and warm: playing games, making dinners and loving the quiet solitude of the home out on the bluff. Thank you and my family will definitely be back (perhaps in the Summer for the Lavender Festival)! ***Please note that the nightly rates on this property are based on 4 guests, each additional guest is $25/night up to 8 persons max.